This 7 oz. Bulwark high-visibility flame resistant safety vest offers comfortable and durable protection for the job. This 7 oz. 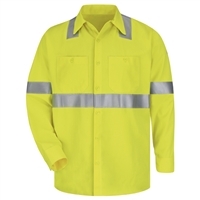 Bulwark flame-resistant high visibility work shirt provides the protection you need with the look you want. This National Safety Apparel flame-resistant high-visibility henley is proudly made in America and is built to keep you comfortable and safe. This National Safety Apparel flame-resistant high-visibility hooded sweatshirt is proudly made in America and is built to last and to keep you safe. These FR Hi-Vis bib pants from Helly Hansen will keep you safe on the job when you need more visibility to be seen. The Men's FR Cornerbrook High Vis Jacket is extremely tough and resistant to chemicals, heat, fire, abrasion and acids. 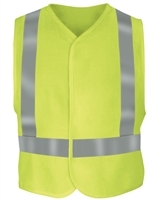 These FR Hi-Vis bib pants from Helly Hansen have reflective material in CSA style striping for enhanced visibility. The Helly Hansen FR Hi Visibility Wabush jacket will keep you safe while you are on the job. The Mens Helly Hansen Hopedale parka is the ideal rough weather companion!